Is Summer Really The Best Time To Buy? First, a clarification: There isn’t a single housing market for the entire country; instead, housing markets tend to be micro-focused. What holds true for a city or even neighborhood may not be true for the next nearest region. A big part of determining when to buy should be the market trends for the area you are looking at moving to. That being said, summer is a popular time to buy because many people with school-aged kids want to wait until school is out for the summer before moving house. In a market with fewer homes for sale in a given price range than there are interested buyers, you could easily end up in a bidding war and pay more for the home than you would without that flooded market. If you aren’t restricted by kids in school, it can be more beneficial to wait. Whether you’re buying an existing home or you’re working with a home builder to finally build the designer home of your dreams, one of the biggest factors in any home purchase is your financial situation. Even if the timing is right and you’ve found the perfect house, if your finances aren’t in order, that could end up being decades of added cost you don’t need. For example, if you’ve recently purchased a car or otherwise have a lot of debt, it may be better to wait six months and pay down that debt first in order to get a lower interest rate. Conversely, if you’re renting currently and paying as much or more than your anticipated mortgage, buying sooner could be a boon. The other side of the finance question is that of economic trends, both locally and nationally. Specifically, we’re talking about what’s going on in the economic world to impact mortgage loan rates. If you’re planning to buy in the coming year and you have some flexibility, tracking interest rate trends can help you time your home purchase for a better rate. However, if you choose to wait, be sure you aren’t making any other major purchases that will affect your credit score or debt-to-income ratio. 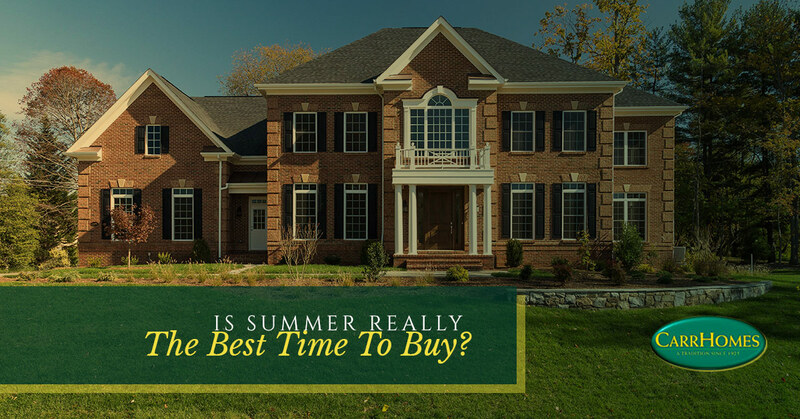 For many, summer isn’t necessarily the best time to buy in terms of price, but it is in terms of other obligations or time constraints. For example, if you’re moving away from the town in which you currently live, it’s probably better for your kids to wait until school is out to disrupt their lives just that little bit less. But, if you’re empty nesters with time to spare and specific preferences, restricting yourself to summer home shopping may mean you miss out on that perfect designer home that enters the market in autumn. If you do choose to house hunt during summer, also keep summer holidays in mind. Not only can they impact travel, but holiday weekends can be a prime time for home buyers coming in from out of town. Are you on the hunt for the perfect home in the Hamilton, Virginia area? Skip the hassle of house hunting and worth with the designer homes team at CarrHomes to build just what you’re looking for. Contact us today to learn more!